We are often asked how to choose an accent color for a room. An easy thing to do is to pull a color from an existing piece in the room. For example, using your area rug for inspiration. Let's say you have an area rug with a deep red, tan and black design on it. Pull the deep red out of the rug by focusing in accents in that color. Use the red in the throw pillows on your sofa, your drapes, silk flowers, candles or a vase. You get the idea. Just don't over do it. The point of an accent color is to bring out a color in the room, not to make it the only color in the room. An accent piece such as a painting, a vase or a decorative bowl can also serve as inspiration for a color to continue as an accent in your space. 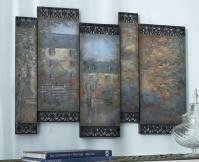 For more great design ideas visit www.cheapchicdecor.com.